It was midsummer of 1576 at Halidghati, Bhil warriors kept a close watch on the Mughal army from the hills. The Mewar army under the command of Maharana Pratap were preparing for a heroic battle, which would lend them immortality on the fields. The battle lasted for four hours, where around 3,000 brave Rajput horsemen fought 10,000 horsemen under Mughal command. Rana Pratap led his army skillfully to give a hard time to the Mughals. Bhil warriors contributed to the war by paralyzing the opponents with arrow showers. It is believed that Bhils took care of the injured Pratap after the battle ended and later accompanied him in guerrilla warfare assaults against the Mughals. 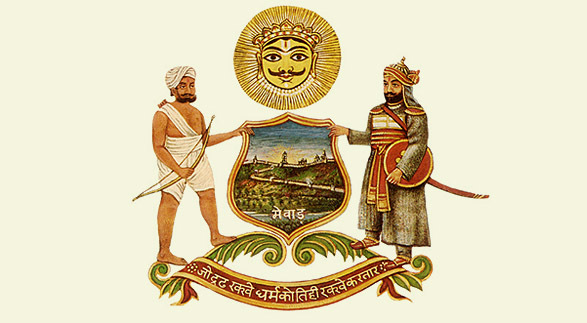 To honor the heroic contributions of Bhil warriors in wars, a Bhil warrior was given placement adjacent to the king, in Mewar’s Royal Coat of Arms. 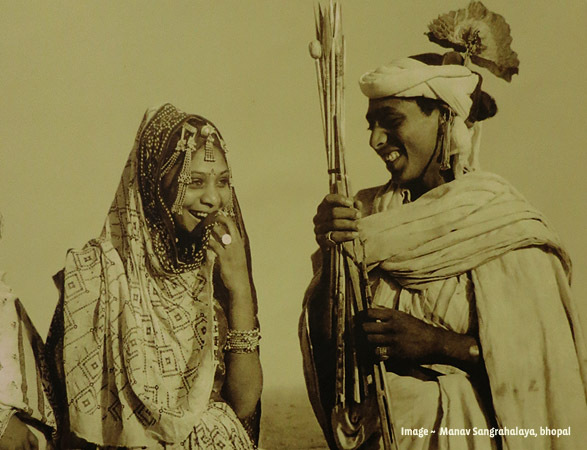 Bhils also find their mention in the great Hindu epics of Mahabharata and Ramayana. 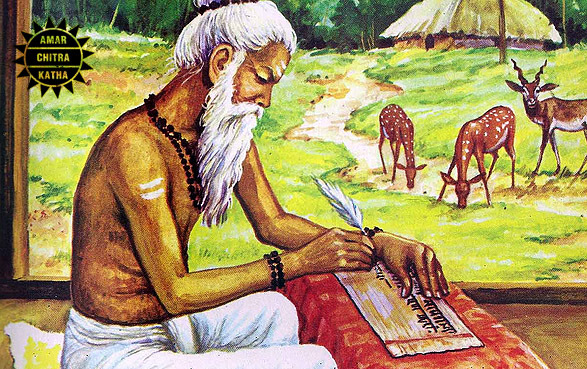 The great writer Valmiki was also born in the tribe. One day he witnessed a hunter killing a bird, Valmiki was so touched by the incident that seeing the pain of the bird he broke into a song to exude his feelings. Lord Brahma, the God of creation heard the song and was enchanted. He emerged in front of Valmiki and asked him to create such verses describing the life of Rama. Hence, Brahma gifted Valmiki with the knowledge of Rama’s life. In Mahabharata, the archer prodigy Eklavya was born to a Bhil couple. When Guru Dronacharya repeatedly rejected his admission to Gurukul, he mastered the art of archery on his own by keeping an idol of the Guru in front of him. Endowed with finest of talents in archery, Eklavya gave his thumb to Dronacharya on being asked for it as the Guru-dakshina, the offering for the teaching. 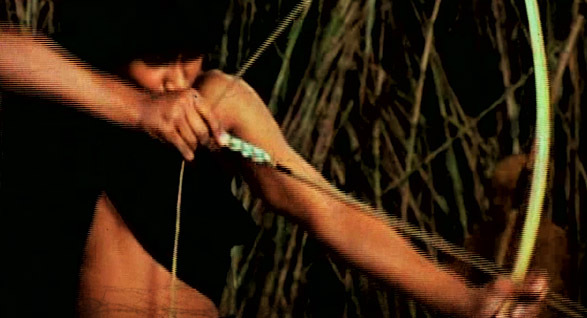 Till date, the tribe takes pride in their traditions and the craft of making Bow and arrows. 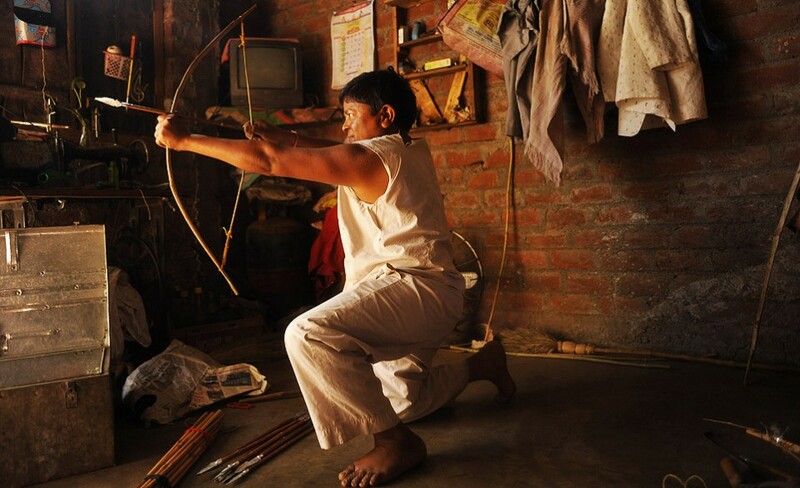 It is mandatory as a Bhil man to master handling bow and arrow. Their aim is quite accurate and it is believed that they can claim a target from a kilometer’s distance. Bow and arrow are made by a particular group of people in the tribe, they use locally procured bamboo, cane, iron, rope and feather. 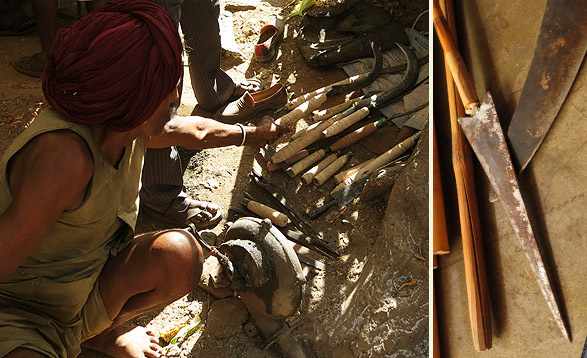 The tools are also quite simple and most of the job is manual, the tools include Daratha (sickle), Bogda (long knife), Hathodi (hammer) and Aari (saw). A 4”-4.5” thick solid bamboo is taken and split into two parts, it is then sanded and heated. Two slits are made on either side and a Pincha (thin piece of bamboo) is tied to it. This piece acts as a pull and usually two pieces are tied adjacently, if one breaks, the other can come handy. Owing to increasing intolerance, open sale and use of these weapons in the region has been prohibited; hence, wooden arrowheads have replaced the earlier metal arrowheads. 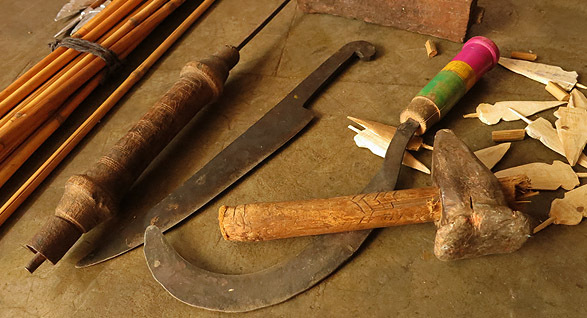 Lohars (blacksmiths) fabricate the arrowheads and the arrows are made with cane. The arrow is sharp on the head and adorned with eagle feathers on the rear end. 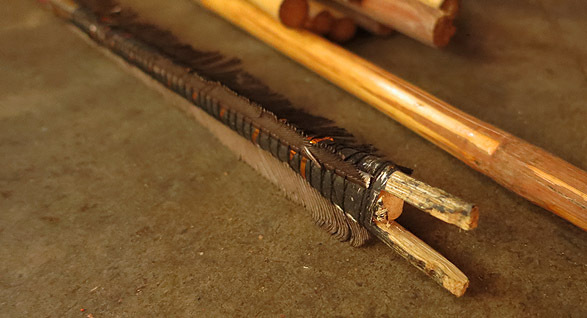 It is a common belief in the tribe that the eagle feather tied to the arrow lends accuracy to the aim. The form of the arrowhead is such that when it gets inserted in the body, it can’t be take out without causing further injuries. The bow is ornamented with silver and gold ribbons; even the arrows are painted with bright colors. 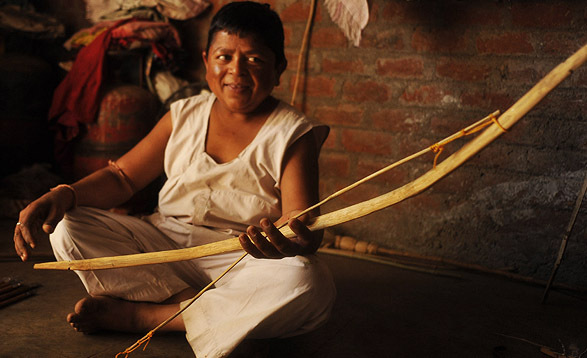 This aerodynamic design of the arrow has been evolved by the skilled Bhil craftsmen over centuries. Archery as an art and bow & arrow has been prevalent since man learnt to hunt. For equally primitive tribes, it still remains the primal means of defense.